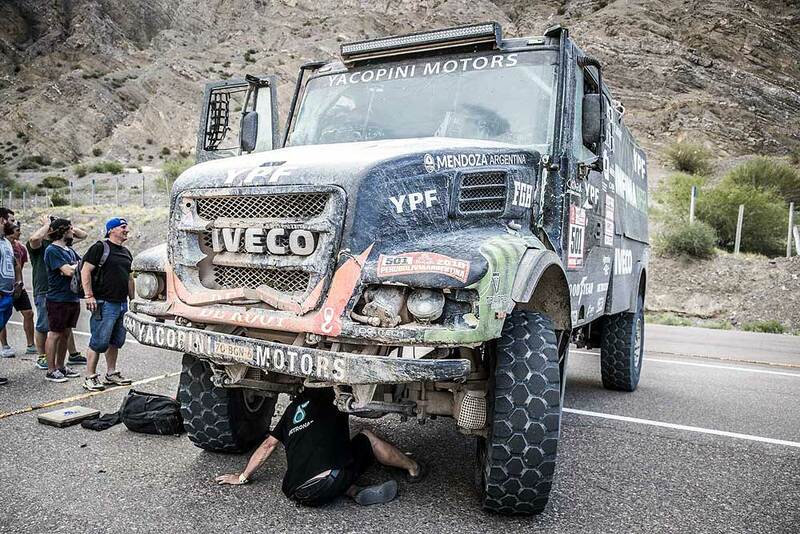 A dramatic day for the Dutch Iveco-Team De Rooy: Cordoba-based Argentinian Federico Villagra started the day as a contender for victory in the Dakar, but had to stop the fight because of a broken gearbox. Ton van Genugten, who managed to win SS12, came without power steering in a special with hundreds of turns. Artur Ardavichus was the only Iveco driver who could speak of a more or less reasonable day. The chances for Villagra were life-size. He started the penultimate stage of the Dakar on a deficit of just one second on the Russian Kamaz-pilot Eduard Nikolaev. The Iveco driver started energetically in the stage in the area where he comes from. But already in the first part of the special it went wrong. It started with a puncture, which the crew could not change quickly, because they had lost the air cushions along the way. The Rooy Iveco teammate Artur Ardavichus was around 10 minutes behind Villagra and could help. Shortly after Villagra got back on track, the gearbox broke. The Iveco could only go in one gear and not faster than 45 km/h. The Argentinians reached the connection between the two special stages with that hurdle. The mechanics concluded that it could not be repaired on the spot and Villagra had to throw the towel. The hope of Team De Rooy was then based on Ton van Genugten, who drove around the third position and – partly due to the withdrawal of Villagra – suddenly was in podium contention. At the first measuring point in the second stage, Van Genugten already was in second, with only 55 seconds to make up for on Airat Mardeev. All chances, therefore, for both another nice result in the leg and a good classification in the final ranking. But the saying ‘to finish first, one first has to finish’ also applied to Van Genugten. Halfway through the second part of the stage the steering pump broke. The crew could repair it so that the Iveco could continue, albeit without power steering.